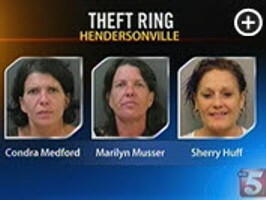 ORC Ring in Hendersonville, Tenn.
HENDERSONVILLE, Tenn. – Police have arrested two women and are looking for at least one other in connection with an alleged shoplifting ring in Tennessee and Kentucky. 50-year-old Marilyn Musser on theft and drug charges. They are looking for 42-year-old Sherry Huff who is also wanted on theft charges. Police said they were alerted to the ring when they were called to a shoplifting complaint at the Walmart on North Anderson Lane on Monday. Police said a woman allegedly tried to steal merchandise without paying. Police said two co-conspirators were discovered in the parking lot. They also discovered several bags of merchandise stolen from numerous retail stores in the vehicle. The contents of these bags included merchandise with affixed tags from several retail stores. The value of the stolen merchandise is over $1,000.